On Friday 11/01, nine enthusiastic walkers headed off early in a heat beating morning walk around Lake Benalla, and its feeder streams (Broken River and Hollands Creek). 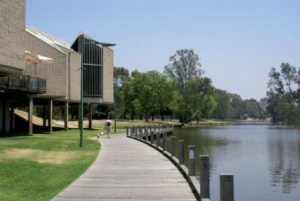 The Lake is close to the commercial centre of Benalla, and some of its surrounds, have been gazetted as a wildlife sanctuary. We made a Figure 8 from the Rose Gardens around the shady paths, and were fanned by a gentle breeze. The natural wetland environment features magnificent river red gums with abundant bird life, and over 30 species were recorded on the walk. We didn’t however notice any platypus or native water rats which also frequent this area. We enjoyed morning tea perched on the roots of a gigantic Morten Bay Fig on Jaycee Island, and by 11am we were out of the sun viewing the Benalla Art Gallery 50th Year Future Perfect Exhibition. This featured the Sidney Nolan Glenrowan tapestry, and we were surprised to learn that this gigantic work was created at a workshop in Portugal. A picnic lunch in the shady botanical gardens completed the morning.